Cairo Opera House strike continues as artists protest on stage against newly-appointed Egyptian culture minister and his decisions, despite scheduled concert with Ramzi Yassa. Published in Ahram Online (by Ati Metwaly, Sara Elkamel). 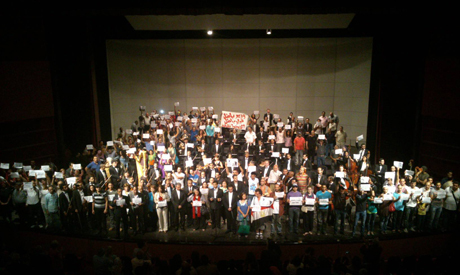 Artists from the Cairo Symphony Orchestra, joined by a large number of Cairo Opera House musicians and supporters, staged a demonstration Saturday evening at the opera house in the capital’s Zamalek district. In place of the planned concert by world-class pianist Ramzi Yassa with the Cairo Symphony Orchestra and conductor Hisham Gabr, artists took the stage in continuation of their protest against Egypt’s newly-appointed culture minister Alaa Abdel-Aziz and his recent policies. Ramzi Yassa, the renowned Egyptian pianist scheduled to perform, joined the protesting artists on stage. Also on stage were recently sacked ministry officials – former head of the Opera House Ines Abdel-Dayem, former head of the Egyptian General Book Authority, and Salah El-Meligy, former head of the Fine Arts Sector. Prominent Egyptian cinema figures Khaled Yousef and Ezzat El-Alaily also joined the stage. The Cairo Opera House artists announced the halting of all performances scheduled at the opera, demanding the resignation of minister Alaa Abdel-Aziz and the withdrawal of all his recent decisions. Nayer Nagui, artistic director and principal conductor of the Cairo Opera Orchestra, also addressed the audience, announcing that the ministry has forbid the entry of cameras into the Cairo Opera House. He encouraged the media and audience to inform others about the strike. He told the audience that they can be reimbursed for their tickets. “We don’t want to,” several people in the crowd shouted. Nagui also announced that at 11am on Sunday 2 June, a march will move from the Opera House to the culture ministry building in Cairo. The audience cheered and applauded along with the protesters on stage. Artists then moved outside the Cairo Opera House gates as they chant against the culture minister. “Say it, don’t fear, the minister must leave,” the audience shouted, surrounded by media reporters. On Tuesday 28 May, Culture Minister Alaa Abdel-Aziz, who was appointed earlier this month, dismissed Opera House head Ines Abdel-Dayem. Tuesday evening, the artists took their discontent outside the Cairo Opera House, paralleling another planned protest staged by visual artists condemning the removal of El-Meligy, head of the Fine Arts Sector. And at 8pm, instead of the expected performance of opera Aida that evening, the curtain was raised on a stage full of hundreds of opera house musicians and staff holding protest signs. On Thursday 30 May, amid rumours that the minister was stepping down, which he refuted, hundreds of Egyptian artists staged a protest outside the main entrance of the Cairo Opera House in the capital’s Zamalek district. Also on Thursday, Abdel-Aziz appointed Badr El-Zakaziki as head of the opera house in Abdel-Dayem’s place.